Garmin GPSMAP 620 is as much at home on the water (sea) as it is on land (roads). Featuring a 5.2-inch touchscreen and waterproof to IPX7 standards, the GPSMAP 620 includes a worldwide base map. The units memory enables you to store up to 1,500 marine waypoints and 1,000 automotive waypoints. You can also store 50 marine routes and 10 automotive routes. Additional mapping is also available on SD card to further enhance the units functionality. Maps available include Garmin BlueChart (marine cartography) and City Navigator (road maps), please scroll down the page for further information. The Garmin GPSMAP 620 marine GPS chartplottter/navigator has been designed to be used for both on the water and on the road. Modelled around the mutil-award winning Garmin nuvi sat nav series, the GPSMAP 620 features a 5.3-inch WVGA touchscreen display, is waterproof to IPX7 standards and has a high-sensitivity GPS receiver. The GPSMAP 620 is preloaded with a worldwide basemap as standard. However with optional BlueChart g2 or g2 Vision mapping you can get fishing charts, tide and current data, marine services and coastal roads. The GPSMAP 620 is NMEA compliant so you can add it to your existing marine network. There is a range of accessories for the 620 including marine mounts and car mounts. The mounts make the device easy to plug and play when using between a car and a boat. The GPSMAP 620 has two different modes, these are marine mode and automotive mode. When the unit is switched on a symbol appears on the screen depicting which mode is currently selected. When marine mode is selected and you are using BlueChart g2 Vision charts you can benefit from the 3D MarinerEye and FishEye which show views above and below the waterline respectively. There is also an Auto Guidance feature that helps guide you around hazards along your route. When the 620 is in automotive mode and you are using a City Navigator NT SD card you get turn-by-turn directions on the road and it even speaks street names. Program in your route and the 620 will find the quickest, most efficient route. The 620 features custom points of interest and proximity alerts to be told about places you may want to stop at in the road ahead. Want to flush mount the GPSMAP 620 on your boat? You need to buy the 620 with Marine Flush Mount Kit. This is ideal for mariners looking for a sleeker installation. 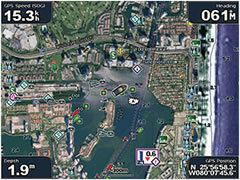 You can also get additional marine charts for the GPSMAP 620. These are BlueChart g2 or BlueChart g2 Vision, which are both available on SD/microSD Cards. The g2 maps feature marine cartography, tidal stations, currents, depth contours, IALA symbols, 3-D map perspective "over the bow" fishing charts and more. The g2 vision charts include the same as the BlueChart g2 but also include high-resolution satellite imagery, above and below the waterline 3-D perspectives, auto guidance technology, aerial photography of ports, harbours, marinas and waterways and coastal roads, etc. Charts available include: UK and Ireland, Central and Eastern English Channel among many other areas and regions. To view them all click here. 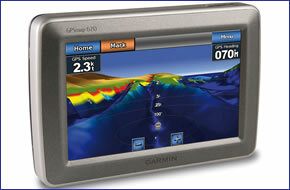 The Garmin GPSMAP 620 includes a marine mount with power/data cable. An optional automotive mount with vehicle power cable (with built in speaker) is also available when using the Garmin GPSMAP 620 on the road. Garmin GPSMAP 620 is preloaded with a worldwide basemap. To really bring the Garmin GPSMAP 620 to life - we recommend purchasing either BlueChart g2 Vision (for sea - pictured right) and/or City Navigator NT (for road). For more information about Garmin marine Bluecharts click here. Looking for Garmin GPSMAP 620 accessories? Accessories available to purchase include powered marine mount, automotive mount and carrying case. To view them all click here. Add Garmin BlueChart g2 HD and g2 Vision HD marine charts to your Garmin GPSMAP 620, view the different charts you can buy from ActiveGPS here.